This week’s image ‘Gardens by the Bay at night’ was found on Alamy. ‘Gardens by the Bay’ was created as part of a government led initiative to transform Singapore from a ‘Garden City’ to a ‘City in a Garden’. This image shows one of the main attractions – ‘The Supertree Grove’ formed of artificial tree-like structures that shoot up to heights of 50 metres. The Supertrees work to maintain a neutral environment for plants to grow in, providing shade and space for exotic plants to grow – and can even absorb rain water. An elevated walkway has been constructed between two of the larger Supertrees, where a treetop restaurant with panoramic views is being planned. 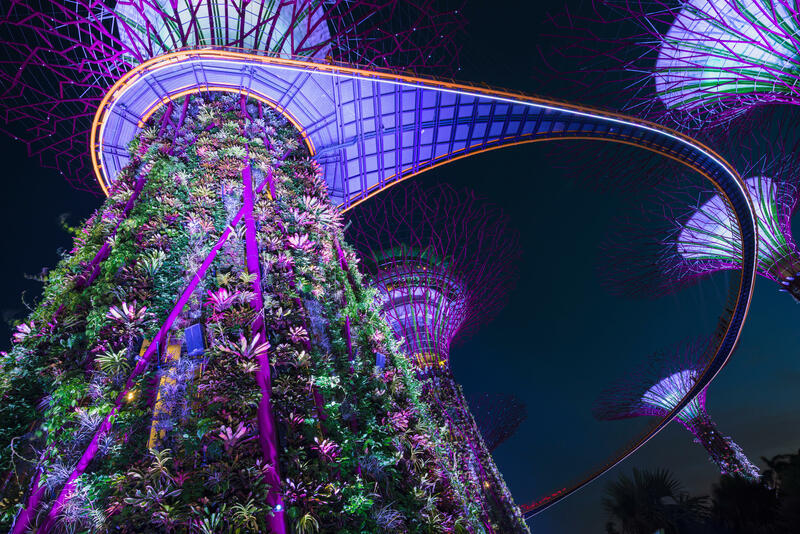 The Supertrees are best viewed at night when they light up in neon colours, to the sound of a music show called the ‘OCBC Garden Rhapsody’.